With the recent addition of a midwife to its staff, East Bay Women’s Health expands on its commitment of providing a variety of birthing options, including alternatives to invasive, surgical birth. 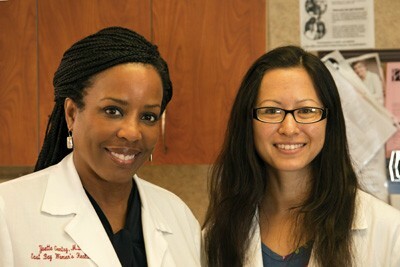 Dr. Yvette Gentry (left) and Certified Nurse Midwife Audrey Muto. With two locations serving Northern California, East Bay Women’s Health (EBWH) provides an impressive suite of obstetric and gynecology services, pre- and postnatal care, DaVinci robotic surgery—as well as aesthetic procedures. With the addition of a midwife, EBWH furthers its goal of providing excellent healthcare options to women of all ages, throughout the East Bay. With the recent addition of a midwife to its staff, Gentry expands on her commitment of providing a variety of birthing options, including alternatives to invasive, surgical birth. A cesarean section (C-Section) is when a baby is delivered via an incision made through the mother’s abdomen and uterus. For some high-risk women, it’s the only option however in other circumstances, a C-Section might be necessary in the event of complications during birth – the baby’s head is too big for the birth canal, stalled labor, etc. It is an invasive surgical procedure and recovery times can vary—up to six weeks or more. You may have to stay in the hospital for a few days—longer if there are complications that necessitated the surgery. However, other than emergencies, C-Sections are often scheduled well in advance. Is it possible for women to have a V-Birth after a C-Section? The short answer is yes, but the concerns are real. Women who’ve had C-Sections are at risk of rupturing their surgical scar during pregnancy, or labor. Unfortunately, many hospitals and providers won’t allow a vaginal birth after C-Section. Our partnership with Alta Bates has enabled us to provide alternatives to women seeking a natural birth after C-Section. If we encounter complications or problems during a delivery, there are board certified physicians there to assist. Women seek us out because we are one of the few practices that provide these services. What Should Women Expect During V-Birth? Understandably, a lot of women who’ve experienced a C-Section don’t want to go through the experience again—but still want more children. Natural childbirth can be very dangerous after one—for the baby and the mother. We take a number of additional precautions with women seeking a natural childbirth after a C-Section. This includes increased monitoring during pregnancy and labor, and they will be on an IV throughout. Additionally, we educate our expectant mothers on what to expect with a vaginal birth because they haven’t experienced it previously. We’re delighted to say, we’ve been able to provide our patients with many successful V-births after C-Section. The most common surgery in the US isn’t an appendectomy, or a tonsillectomy—it’s a C-Section. Nearly one in three babies born in the United States is delivered via C-Section, an invasive surgical procedure, which exceeds the global average. Midwife Audrey Muto recently joined East Bay Women’s Health to assist women seeking natural childbirth options. Midwives are trained health professionals who believe childbirth is a natural process. We assist and educate healthy women throughout their pregnancies with prenatal care, advice, and “coaching” before and during labor. A midwife will also help women transition to motherhood providing advice on self-care, and the care of their newborn. Midwives are experts in normal, physiological childbirth. We seek healthy low-risk women because we believe that birth is a normal event that shouldn’t be treated like an illness. Midwives work with expectant women to plan their care, and prepare them for what to expect during pregnancy—and a vaginal childbirth. Once a baby is born, a midwife will assist and educate new mothers on breastfeeding techniques or address issues with lactation. Midwives will advise a new mother on postpartum depression or other mood disorders. Our aim is to educate, monitor, and assist our patients during the entire childbearing year and beyond. Additionally, a midwife performs wellness exams, provides contraceptive counseling, and advice on menopause. And yes, a midwife can deliver babies; however I won’t be performing deliveries here. East Bay Women’s Health in Oakland and Alameda understands that scheduling your doctor’s appointment during the work week can be daunting, if not impossible. That’s why the OB/GYNs at East Bay Women’s Health open their doors every Saturday to provide prenatal and gynecologic care on the weekend. Call or request an appointment online to schedule your Saturday appointment today.